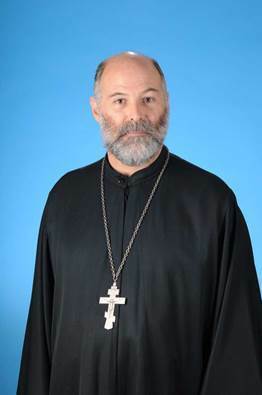 Sts Constantine & Helen Greek Orthodox Church of AV would like to warmly welcome Rev Father John Beal, who has just been assigned by His Eminence Metropolitan Gerasimos to serve as our new Parish Priest beginning Feb 10th 2018. Father John Beal is a native Californian, who attended St. Vladimir Orthodox Seminary and was ordained to the Priesthood in the OCA church in 2007. He has been serving the Bulgarian Diocese of the OCA in Los Angeles and also served for one year at St. Sophia Catedral assisting Father John Bakas. Fr. Beal works as a Chaplain and lives in the LA area. He is married to Presvytera Medea Magdalen, and they have a daughter Magdalen Maria Theresa.